one on the top left. Red imported fire ants keep adapting to life in the United States. They keep spreading farther and farther north from their foothold in the Southeast, often overtaking native ants along the way to become the dominant species. But scientists at ARS' Center for Medical and Veterinary Entomology (CMAVE) are hot on their tiny trails, developing new ways to keep their numbers manageable. Researchers with the Imported Fire Ant and Household Insects Research Unit in Gainesville, Florida, have made many discoveries since the late 1970s in their efforts to control fire ant populations. Their strategy is to reduce the amount of chemical treatments needed by developing self-sustaining biological control agents. The red imported fire ant, Solenopsis invicta, was accidentally introduced into the United States in 1929 from South America. Fire ant population there is only 20 percent of that here, probably because North America lacks natural enemies of the ant. They are particularly disruptive because of their large numbers and painful sting; about 40 percent of people in infested areas are stung each year. Fire ants dramatically reduce populations of native ants, other insects, and ground-nesting wildlife. They also damage many crops and much electrical equipment. Damage and control costs are estimated to be more than $6.5 billion a year. Red imported fire ants currently infest more than 320 million acres in 12 southeastern states and Puerto Rico and have recently spread to California and New Mexico. Although fire ants keep moving into new areas, a recent ARS model predicts that they will not be able to survive in areas where soil temperatures drop to near freezing for more than 2 to 3 weeks. 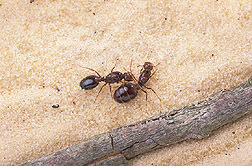 Black imported fire ants, Solenopsis richteri, introduced to the United States in 1918, are less widespread. A hybrid looks the same as the red ants, so laboratory tests are needed to tell them apart. Two pathogens from South America are known to infect fire ant colonies, and research is continuing into their effectiveness as biological control agents. CMAVE researchers were the first to discover Thelohania solenopsae in the United States in 1996. This single-celled protozoan parasite infects colonies when workers transfer it to the queen, possibly through food exchange. It reduces the queen's weight, and she lays fewer eggs. Colonies die out after 9 to 18 months. CMAVE researchers learned they could infect colonies by introducing brood infected with T. solenopsae. Since fire ants will accept brood from foreign colonies, the parasite is now established in many regions. But because the transfer of live larvae and pupae is very tedious and not entirely effective, experiments are under way to see which life stages best transmit the pathogen to the queen. Entomologist David Oi recently discovered in fire ant pupae a new T. solenopsae spore type that he believes might be capable of initiating infection. Some fire ant colonies have only a single queen, while others have many. A single-queen colony can have 250,000 workers, whereas a multiple-queen colony can have twice that number. Multiple-queen colonies are easier to infect with T. solenopsae because they will adopt and raise infected brood from other colonies. But, on the downside, says Oi, they are harder to control because their large populations limit the pathogen's impact. "Single-queen colonies are more suspicious of outsiders, but they will raid other colonies and take their immature ants," says Oi. "So, we can establish an infection in single-queen colonies, but it dies down after awhile." The researchers are studying another pathogen, Vairimorpha invictae, that is more lethal but also more rare than T. solenopsae. (See "Ouch! The Fire Ant Saga Continues," Agricultural Research, September 1999, p. 4.) V. invictae is hard to keep alive in the laboratory, so the scientists must occasionally have infected colonies sent from ARS' South American Biological Control Laboratory in Buenos Aires, Argentina—where it is being studied in the field—to examine the pathogen under quarantine in Gainesville. A new disease has been discovered by CMAVE insect pathologist Roberto Pereira. It's called yellow head disease because of the yellow-orange color ant heads and other body parts turn when infected with the spindle-shaped spores. A protozoan from the genus Mattesia was present in 34 percent of sites and 8 percent of nests studied in Florida. The pathogen causes extreme changes in appearance, but its full impact as a potential biological control agent is still under investigation. David Williams, head of the Imported Fire Ant and Household Insects Research Unit, is also searching for viruses to use against the ant. "Back in the late 1970s, a researcher looking at red imported fire ants found a virus-like particle, but it died in the lab," Williams says. "There are viruses in ants, but finding them is tedious and laborious work. They can be extremely virulent if you get the right one." He believes this untapped area has great potential for new discoveries, and he hopes to bring a molecular biologist to their team soon to aid in the search. Williams is also evaluating a parasitic ant, S. daguerrei, under quarantine. It is found only on fire ants in Argentina and Brazil. The parasite doesn't produce workers, so it relies on its host, taking resources from the queen while the colony feeds and maintains its brood. Mound densities were 33 percent less in sites with the parasitic ant, and the number of fire ant queens was 47 percent less in parasitized colonies. Fire ant decapitating phorid flies, from the genus Pseudacteon, are natural enemies of imported fire ants. Just their presence keeps frightened ants from leaving their mounds. That alone is good news because it forces a shift in when the fire ants forage and allows native ants to compete better. A female fly hovers over a mound before she pinpoints a victim, dive-bombs it, and deposits one of her eggs inside it. The egg, as researchers at the center discovered, eventually produces a larva that eats its way to the head and causes it to fall off. Entomologist Sanford Porter estimates there are about 20 types of Pseudacteon flies that attack fire ants. They could be used to complement each other in control efforts. So far, two phorid fly species—P. 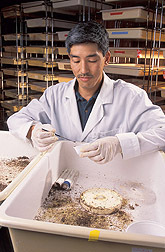 tricuspis and P. curvatus—have been released and established in the United States. P. tricuspis took hold and is expanding at the rate of 10 to 20 miles a year. P. curvatus works better on black imported fire ants and the hybrid than on red ones. It was imported from Argentina and is being used in Alabama, Mississippi, and Tennessee. A third species, P. litoralis, works especially well on the red ants and has been approved for release in field studies. Porter and colleagues at ARS' Biological Control and Mass Rearing Research Unit, located near Starkville, Mississippi, developed an attack box that has greatly improved their ability to mass-rear phorid flies. The boxes are held under environmental conditions that strictly mimic the flies' natural habitat. Specially designed cups are alternately raised up and down within the box in a cycle every 10 minutes, causing the ants to run from one cup to the other. This action allows the phorid flies to easily attack and parasitize them. New flies are continually released into the main attack box from an attached holding box at one end to maximize the amount of eggs deposited. Because CMAVE reached its capacity to rear the phorid flies, an initiative to mass-produce them was launched with ARS, USDA's Animal and Plant Health Inspection Service (APHIS), and Florida's Department of Agriculture and Consumer Services. The new facility in Gainesville will eventually produce 6,000 to 12,000 flies a day. 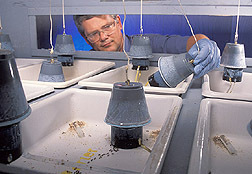 Chemist Robert Vander Meer studies semiochemicals, such as pheromones, in an effort to modify ant behavior and control the pests. Social insects like fire ants use semiochemicals to communicate with each other and influence activities. Vander Meer wants to see how the ants use these compounds and then disrupt the processes. One reason fire ants are so troublesome is that they commonly short-circuit electrical equipment of all kinds. Of course, they electrocute themselves in the process, and large numbers of dead ants are sometimes found piled up in electrical mechanisms. Vander Meer and Porter discovered that electrocution causes the ants to release alarm pheromones that attract other ants as well as phorid flies. In response to these pheromones, phorid flies lay more eggs in ants, and fly production increases by 15 to 20 percent. This knowledge will help them develop new ways to use alarm pheromones in biological control programs. Vander Meer is involved in other fire ant pheromone projects. He found that fire ants use their stinger not only for defensive purposes but also for pheromone dispersal. His knowledge of how fire ants use semiochemicals to recognize intruders enabled scientists to decipher how two parasites (a beetle and a wasp) are able to infiltrate aggressive colonies. Pioneering work revealed how fire ants locate food and recruit other workers to the source with pheromone trails. 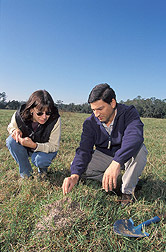 An ARS-funded areawide project began in March 2001 to demonstrate how to keep fire ant populations at very low levels by combining strategic pesticide applications with phorid flies and T. solenopsae. Diverse demonstration sites—as large as 300 acres—in five states were chosen for the project to represent the fire ant's infestation range, according to Williams. ARS is coordinating the major activities of four land-grant universities and other organizations associated with the project for 4 to 5 years.—By Jim Core, Agricultural Research Service Information Staff. This research is part of Arthopod Pests of Animals and Humans, an ARS National Program (#104) described on the World Wide Web at http://www.nps.ars.usda.gov. 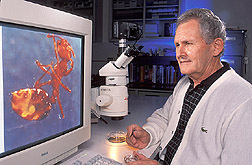 David Williams is with the USDA-ARS Imported Fire Ant and Household Insects Research Unit, CMAVE, 1700 S.W. 23rd Drive, Gainesville, FL 32608-0000; phone (352) 374-5903, fax (352) 374-5818. "Update: Hot on the Trail of Fire Ants" was published in the February 2003 issue of Agricultural Research magazine.